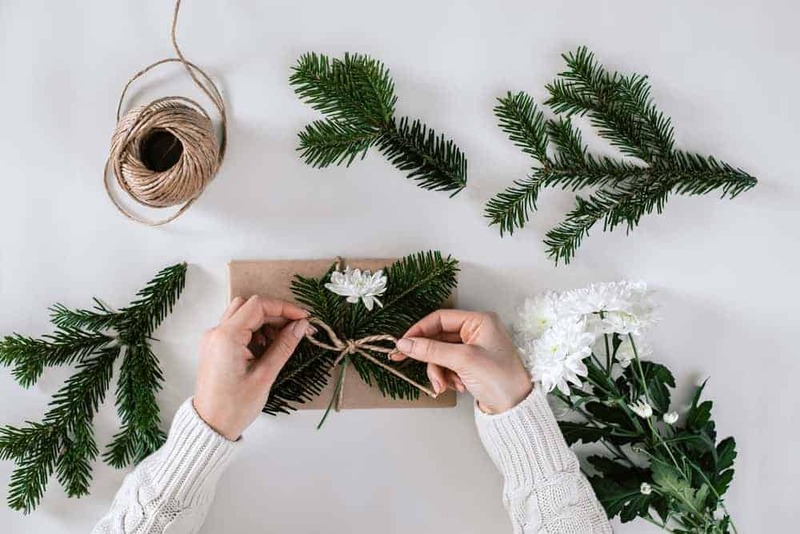 Today I wanted to share some of my favorite eco-friendly gift wrap ideas with you. That’s a huge environmental impact! One way to reduce your environmental impact this holiday season is to use eco-friendly gift wrap. Obviously the most eco-friendly idea would be to not wrap your gifts, but for most of us that’s probably not going to happen. Opening gifts is a huge part of the fun of Christmas right? I used to think that gift wrap could just be recycled, it’s just paper right? However many types of gift wrap have dyes and plastics that make them difficult or impossible to recycle. So today I decided to share some of my favorite gift wrap ideas that are eco-friendly and pretty too! One of my favorite ways to wrap gifts is to buy basic brown kraft paper. It’s really inexpensive and it’s recyclable. There’s also the added benefit that kraft paper doesn’t slip as much and is easier to fold, so you won’t have to use as much tape (or even any tape at all) when your wrap gifts with it. I know some people think it’s tacky, but I reuse old gift bags and tissue paper from gifts that I receive. Maybe I’m just cheap, but I think it’s better than purchasing new gift bags and tissue paper because I’m not creating new waste. I would rather reuse an old gift bag than throw it away and having to buy a new one later on. One way to reduce the environmental impact of your gifts is to not use tape. 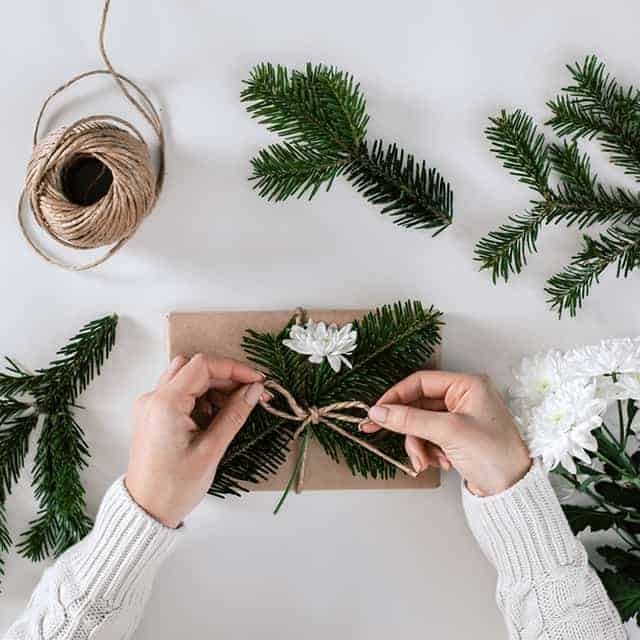 You can secure the edges of your packages by tying twine around it (obviously this trick will only work if you are wrapping a square/rectangular gift, it’s a little bit trickier with odd shaped packages). You can also wrap your gifts without any tape! I love this video (see below) that shows you how you can wrap gifts without using any tape! It’s fairly easy to make your own gift bags. One of the great things about making your own is you can use whatever type of paper that you have handy. You could use leftover scrapbook paper, brown paper, or even some of the eco-friendly wrapping paper we talked about earlier! If you have scraps of scrapbook paper or printer paper you can use that to wrap smaller gifts! Scrapbook paper would look so cute as wrapping paper and if you tie it with some twine it will look fantastic! One of my favorite eco-friendly (and budget friendly) gift wrap ideas is to use brown paper bags. I always try to get paper bags from the grocery store if I forget my reusable bags (which I do a lot) so I always tend to have a couple extra paper bags hanging around. I just cut the bags open on one side, turn them inside out, and then wrap my gifts! It’s a simple and easy way to wrap gifts with something you already have! You can also throw on some pine cones, or sprigs from a pine tree to add a beautiful touch to your gift! Another great way to make plain brown paper look fantastic is to draw your own patterns on it. You can use a white colored pencil, chalk, or a chalkboard marker to create beautiful, custom designs for your gifts! Don’t you love these homemade gift tags? I love that the Christmas tree is made from an old map! I also love how simple and easy these eco-friendly gift tags are to make! I love this idea for wrapping your gifts. I love the beautiful Christmas sayings and the added bonus of eucalyptus stems! If you still get the newspaper you can use newspaper to wrap your next Christmas gift! It looks absolutely stunning and it’s recyclable! Which of these gift wrap ideas is your favorite? I also sometimes purchase Christmas and/or birthday paper at Goodwill–they have some lovely paper and bows, too. I would not have thought about dyes and chemicals in the paper, so thanks for that information as well.